ASU students in the Daedalus Astronautics club were a crowd favorite at the 2012 Large Dangerous Rocket Ships (LDRS) competition in New York last month. 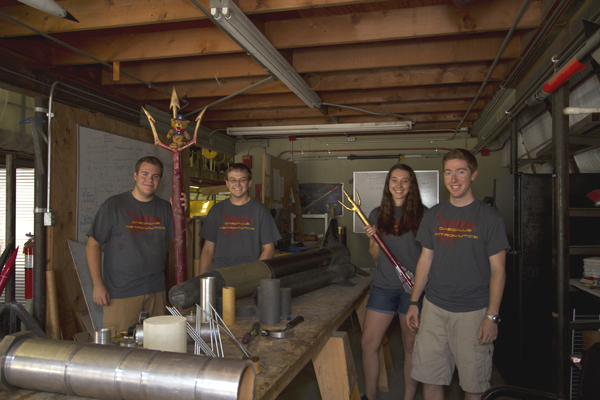 The team developed the idea for the rocket and built it over the summer, then had to assemble everything at the event. In true Sun Devil spirit, the unusual rocket is a giant pitchfork with Wilbur Wildcat strapped to the tines at the top. The short window to assemble the rocket posed problems for the team. Without enough curing time for the foam holding the weights in the top of the rocket in place, the center of gravity changed and the rocket went spiraling. However, the team says the nontraditional design was more fun, and gave them a better understanding of rocketry concepts. 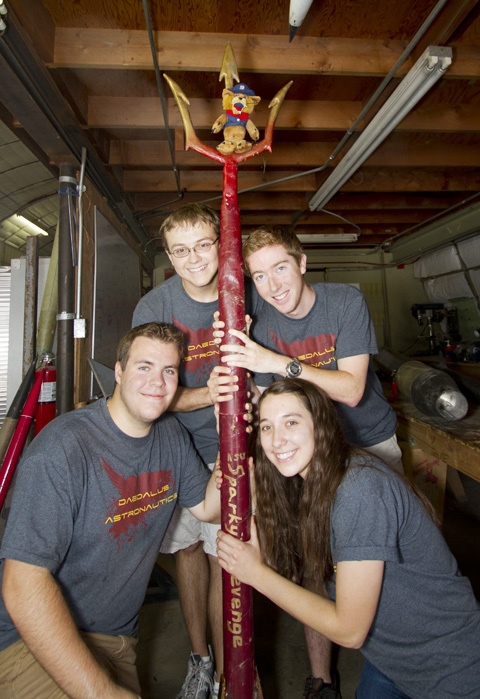 Held each summer, the LDRS competition brings together rocket enthusiasts from around the country to test their skills. Rockets range from the traditional to the unique, including a grandfather clock, snowmobile and tiki bar. ASU’s win last year – reaching 10,000 feet in just 6.8 seconds – remains one of the favorite videos on the Discovery Channel’s site. The 2012 videos will be released on Halloween night.